Do you struggle to follow up with clients? Or do you find yourself missing deadlines or turning in shoddy work because you put off a task? Or as a student, do you wait to complete that assignment until the last minute? Or are you avoiding making an appointment that is important for your health? In this article I want to share with you main reasons of procrastination and top 5 strategies how to stop procrastinating. Do you find yourself not following through or avoiding tasks that you know would be good for you, like going to the gym to exercise or starting that diet? You might be putting off writing that blog or creating that video, or following up with prospective clients even though you know doing these tasks would move you in the direction of your goals and vision. You are not alone in your procrastination. Research indicates almost everyone does it to some extent, and it seems to be an increasing social problem with all of the ways we can get distracted in today’s world of Internet and social media. Psychology Today reports that 20 percent of people chronically avoid performing tasks that are considered difficult (Heshmat, “The 5 Most Common Reasons We Procrastinate”). Compare this with 5 percent in 1970! 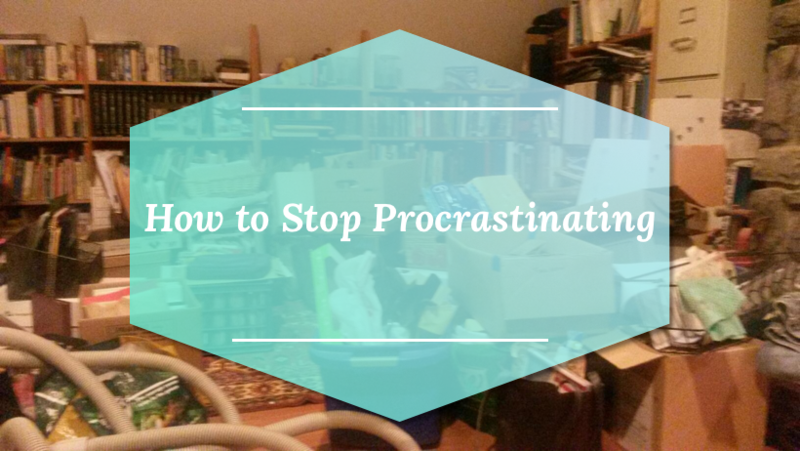 We may ask the question, Why do we procrastinate? I’ll get to that, but the more important question is: What is it costing us? Research shows that procrastination may affect quality of work, grades for students, even health issues (Heshmat, “The 5 Most Common Reasons We Procrastinate”). Ask yourself this question and list the potential costs to you. Maybe it’s an increase in anxiety from putting off projects. The increase in anxiety can cause you to eat or drink more. Stress impacts your health and vitality. Maybe it is affecting your trust in yourself, self-esteem, and confidence. Unconscious fear is a primary reason we procrastinate and exhibit other self-destructive behaviors. In his book Rewire: Change Your Brain to Break Bad Habits, Richard O’Connor, PhD, describes how fear creates patterns of self-destructive behavior that keep us from achieving what we really desire. Fear is a normal emotion in our human experience. It is designed to keep us safe. It is a somatic—that is, a whole-body response. As in, the fight-or-flight response, which sends the stress hormones, adrenaline and cortisol, throughout the body. It causes our pulse rate to increase and affects our breathing. In fact, overcoming fear is a common reason people go to therapy. The decisions we make out of fear or avoiding fear will not help us achieve our dreams. It will keep us in our old patterns, stories, and circumstances similar to Bill Murray in Groundhog Day. To achieve our goals and dreams, we need to kick fear out of the driver’s seat and be aware of how it may be showing up in seemingly rational and logical disguises. How Does Fear Show Up? Do you sometimes get really inspired about an idea or project and then quickly lose interest or something derails you? Does this sound familiar? A few weeks will go by and you are right back in the familiar routine of your life. Obsequiously, our brain keeps us from achieving our goals. Do any of these moments sound familiar? You have to check your e-mail and two hours later you realize you haven’t finished your project. Or you might have a promotion opportunity at work and you thought about talking to HR about the promotion, but before you make the call you start to think about the extra work, or stress, and you talk yourself out of the promotion. DEFCON 1 is a United States military term that stands for “Defense Readiness Condition” and number 1 is the highest level employed during times of national security threats. Your brain will employ this high state of readiness. When you are in DEFCON 1, you might get panicky, flushed, sweaty, or jittery and feel uncomfortable for no known reason. You move past logical thinking. It triggers your fight-or-flight reflex and is very difficult to ignore. It triggers an irrational fear and can keep you from getting out of bed in the morning. Can you relate to any of these circumstances? You have some important follow-up calls with clients, and right before you dial the number you suddenly feel butterflies in your stomach and you either don’t dial or hang up when someone answers. You have found your dream home and have the lease all signed; it’s yours, but then you have some terrible fear that you are making a bad decision and you back out of the deal. You have been going to the gym for three weeks and you “hit the wall”: you can’t get out of bed and you are frustrated and angry that you haven’t gotten the results you expected. You can overcome procrastination and befriend your fear. The first thing to realize is that your prefrontal cortex is constantly generating negative thoughts. It is a normal brain process referred to as “inner speak.” The fear you may be experiencing is most likely from a memory of a past experience and not even related to the present moment. Write down your fears, doubts, and worries. The mere act of writing your truth dissipates the emotional charge. Name it to tame it. Relax, stretch, and yawn while writing. You cannot experience anxiety and pleasure at the same time. The yawning and stretching interrupts your fear-based thoughts. Read your list. Again remember to relax, stretch, and yawn while reading the list. Ask yourself: “Is this really true?” Reread the list. The more times you read the list, the words will become meaningless. Meditation strengthens your ability to observe your thoughts without reacting to them. Through meditation you will develop the skill of letting these intrusive thoughts glide past, to soothe yourself, and stay calm. There are many forms of meditation; find a guided meditation or you can use this common form: practice meditating once or twice a day at the same time of day and for the same amount of time. Find a quiet place free from distractions and the sounds or vibrations of your phone or computer. Focus on your breath. Anytime thoughts arise, let them slide by and out of your mind, and return to focusing on your breath. It isn’t about not having thoughts; it’s about observing and releasing them. Clutter is a form of distraction. Even if you think you can ignore the clutter, your unconscious mind will undermine your focus and concentration. Take all the things off your desk that aren’t directly related to the project you are working on. This is one of the most important steps. It might be the most challenging step for procrastinators, and ironically, it is one of the simplest. Start for five-minute increments. Set a timer for five minutes and sit in your chair and just start. Even if you don’t complete anything, sit there for five minutes. Take a break for five minutes and focus on your project for five more minutes. Increase your time increments. As you focus on your project, you will become more productive and may even enjoy your progress. As you make more progress on your project, increase your time increments. Turn off your phone, close the door to your office, put a sign on your door that says “Do Not Disturb.” Power down the Internet. Procrastinators tend to be perfectionists. Their work is never good enough. Therefore, celebrate small successes. Celebrate the progress. Make realistic milestones in your project and celebrate with a dinner out, a good run, or a walk in nature. With small steps in the direction of your goal, you can overcome your procrastination and celebrate your success! My passion, care for people, and commitment to spiritual consciousness motivates me to continue developing tools so people can create a world that thrives for all beings. I hold coaching workshops in Sacramento, San Francisco, Roseville and Santa Rosa. Subscribe my newsletter for new events and consciousness hacking tips to create a life you love.